Enjoy their tea break’s a great breather from the office. Enjoy a cake, muffin, pie, danish or scone + coffee or tea from just $5.90, 2-6pm daily. Then power through the rest of the day. 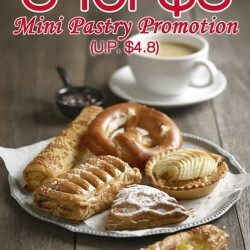 Grab their very yummy and tasty pastry get 3 for $3 Mini Pastry Promotion (U.P 4.8). Available All-Day Long Now. Term and Conditions apply. 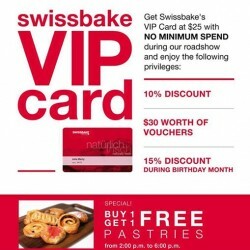 Save 20% OFF Swissbake Cash Vouchers (of $50 value). Valid at all outlets islandwide, on top of existing promotions and discounts. 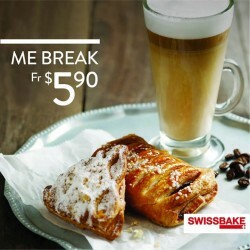 Enjoy AMAZING deals at Swissbake International Plaza today! 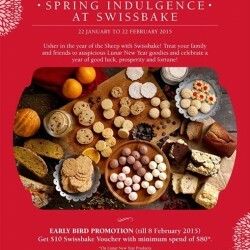 They're giving away attractive discounts, freebies and Buy 1 Get 1 Free Pastries! They're also giving out FREE Chocolate Croissant to their Facebook fans, so hurry down now! 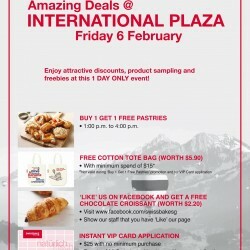 Buy 1 Get 1 Free Pastries only valid from 1pm-4pm on 6 Feb in International Plaza. Usher in the year of the Sheep with Swissbake! Treat your family and friends to auspicious Chinese New Year goodies and celebrate a year of good luck, prosperity and fortune! Early Bird Promotion (till 8 February 2015). 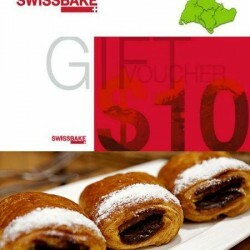 Get $10 Swissbake Voucher with minimum spend of $80. On Chinese New Year Products! Swissbake is NOW OPEN in Paya Lebar Square! To celebrate their Grand Opening, they're giving away attractive discounts, freebies and Buy 1 Get 1 Free Pastries! Valid while stocks last, so join them this Friday at Paya Lebar Square! Buy 1 Get 1 Free Pastries only valid from 2pm-5pm on 16 January in Paya Lebar Square. Enjoy Monday pastry day. 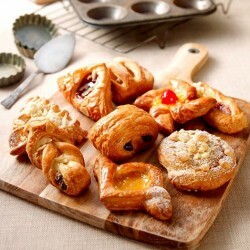 Every Monday after 11am, all their regular pastries will be just $2, and finger-friendly Mini Pastries at only $1 only. Available at their cafes and Kraftwich Café, from 22 February – 28 March. Join now at Swissbake MBLM! For today only, get our VIP Card with no minimum spend and enjoy 1-FOR-1 Pastries from 2pm to 6pm! Hurry down now! Swiss Bake is celebrating its 11! 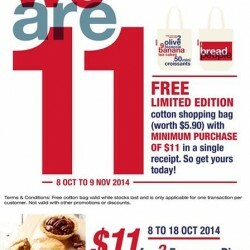 From 8 October till 9 November 2014, just spend $11 at our Cafes or Retail Outlets and receive a FREE LIMITED EDITION cotton shopping bag! What's more, during the first 11 days of our anniversary, our mini European Pies are going for $11 only! So hurry down and get them before it's gone! Swissbake is NOW OPEN in City Link Mall! 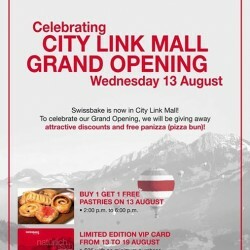 To celebrate the Grand Opening, they are giving away free Paniza (Pizza Bun) and Buy 1 Get 1 Free Pastries! 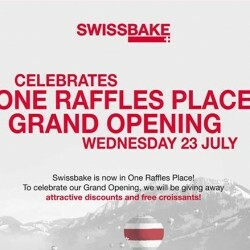 Swissbake is NOW OPEN in One Raffles Place! To celebrate the Grand Opening, they are giving away free Croissants and Buy 1 Get 1 Free Pastries! Valid while stocks last, swing by tomorrow(23 July) at One Raffles Place! Valid from 2pm-6pm on 23 July in One Raffles Place. 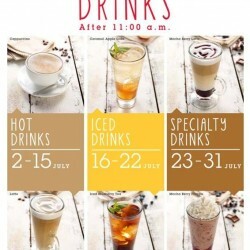 Beat the hot weather this July by enjoying a refreshing 1 for 1 drinks offer from Swiss Bake!